If you have one CleanMyPC license and two computers, you may want to have the program on both of them. Or, you may prefer to transfer your existing license from one PC to another. Instructions for both cases are provided below. If you use your computers actively, you'd probably want CleanMyPC to care for both of them. Luckily, as a current owner of a CleanMyPC license, you can expect to get a 30% discount on any purchase at MacPaw Store. So, all you need to do is visit the store and confirm your ownership by entering the email used for previous purchase. The detailed instructions are provided here. There's also another way to save you some money and get more licenses. In particular, you can buy a CleanMyPC license for two or five PCs at a lower price, and share it with your friends or family. Besides, you'll be happy to know your 30% discount covers this purchase too. Open the activated version of CleanMyPC. 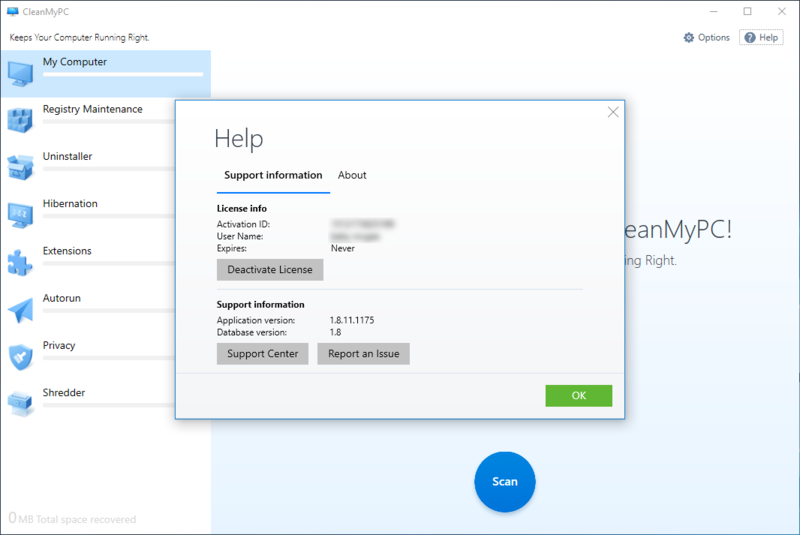 Click Help in the upper-right corner of the window. In the dialog that appears, click Deactivate License. That's it! Now, you can open CleanMyPC on a new computer and unlock the program with the same activation number. If you don't have access to your previous activation, our License Retrieval system can cope with it (find out how). If you still need some assistance, please contact Customer Support.